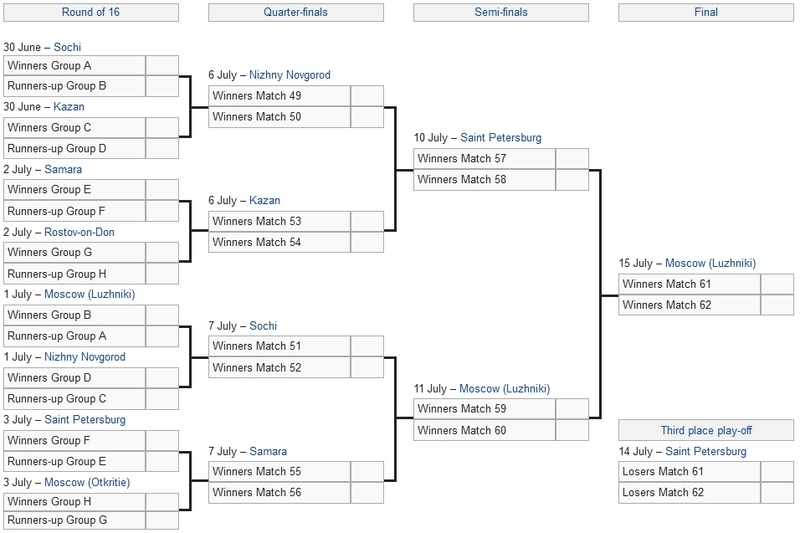 So Russia is through now it will just be a matter of who they play on what side of the draw but at the moment they top the group with a +7 goal difference, meaning they would meet the runner up of Group B.
Russia is still not technically through, but realistically they are. So Russia and Uruguay are confirmed now from Group A, will just be a matter of who finishes first and who they play in Group B which currently sees Spain and Portugal in 1st and 2nd with four points but Iran is 3rd with 3 points and plays Portugal in the last group game. Croatia is not assured of 1st place in the group yet. And all other three teams in Group D can still qualify for the next round. And now all the predictions have gone to the dogs. I really did not expect Iceland to succumb to this rampaging Nigerian team. Have to wait till the last round of group matches to see what happens. Nigeria will throw everything at Argentina in the last game as they will fancy a chance to win and progress. Group C: France are through it will just be if Denmark or Australia are through with them, Peru is out. Group D: Croatia through but Nigeria, Iceland and Argentina all still in it to go through with them. Group E: Brazil, Switzerland, Serbia can all still qualify or be knocked out with only Costa Rica out. Group F: All still to play for in this group, Mexico leading with 6 points but could still possibly end up third, South Korea most likely out but if they beat Germany and Mexico beat Sweden then they could actually still sneak in. Group G: England and Belgium through and its just who is first, Tunisia and Panama out. Group H: Japan, Senegal and Colombia playing for the two spots and Poland out. It will be interesting to see to what extent the teams that have already been knocked out will impact on the final standings in their respective groups. I think that some will be more motivated/willing to do so than others. No that's it guaranteed to happy, but there is a good chance we'll have Uruguay, Portugal, France, Argentina, Brazil. Germany, England/Belgium on one side of the draw. France, Denmark, Croatia and Argentina (just) through now. Setting up France v Argentina and Croatia v Denmark in the Round of 16. Percentages for 1H are sublime. If Brazil end up second it will be interesting to see what Mexico does in that final game if they want to avoid them. A draw and a big German win might suit them nicely. Group F plays the early games tomorrow, so Mexico won't know where Brazil will be ending up in their group until after Group F is done and dusted. Before anyone suggests it, there is NO EASY SIDE OF THE DRAW! 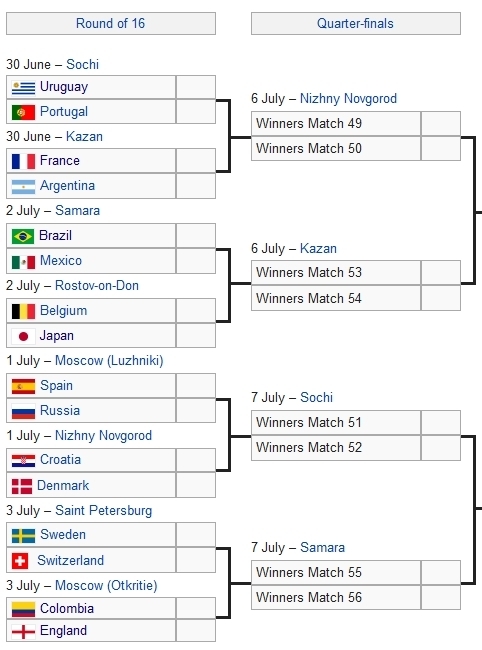 Now the Round of 16 is all confirmed, Japan is the first team to make the knock out rounds using the fair play tiebreaker after finishing on equal points, goal difference, number of goals scored in all group matches, and the game between them and Senegal finishing in a 2-2 draw. They go through on 4 yellow cards to Senegals 6. Sure, but one side is clearly much easier than the other. How would that be? France and Argentina have been rubbish so far. Brazil haven't looked that great either. Some teams may have a bigger reputation but every WC shows us anything can happen, especially in the KO rounds. On the supposed weak side you still have Spain plus Croatia (3 wins out of 3 and playing as well as anyone). I find it a very strange mentality that says "I want my team to win but I don't want them to play any hard teams". At what point is it ok to start playing "big" teams? Because if you get to a quarter final and you're trying to pick and choose your opposition it's not exactly sending a positive message is it.